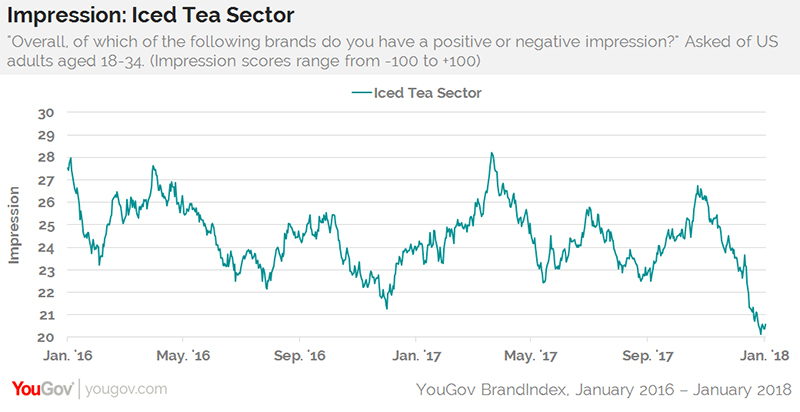 Millennials appear to have grown less fond of iced tea brands over the past two years, according to YouGov BrandIndex. 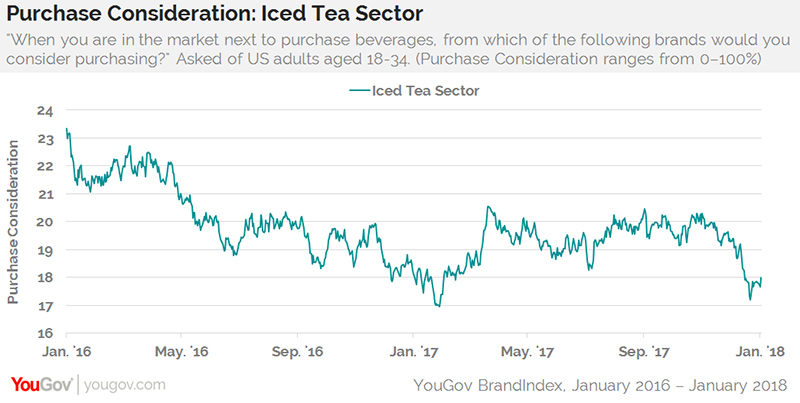 During that period, adults 18 to 34 have slowly had a less favorable general impression of the iced tea sector, with this trend picking up speed in the past two months. Lipton, Nestea, Crystal Light, and Snapple have been trending downward in this metric from the end of October through the present. Only Arizona Iced Tea has had a relatively stable trajectory. Millennials are increasingly less likely to purchase iced tea than they were two years ago. At the start of 2016, 23% of millennials said they’d consider buying iced tea the next time they were purchasing a beverage. Currently, the percentage is down to 18%. Crystal Light has been hit the hardest, dropping a full eight percentage points over the past two years. While no outstanding incident occurred since the end of October to impact these scores, the main culprit may be millennial interest in personal health and their aversion to sugar. Much has been written about sugar content in bottled iced teas, while bottled waters and health beverage sales increased. Last April, Diet Coke and Diet Pepsi posted steep sales declines, while Coke’s revamping of Coke Zero to Coke Zero Sugar is showing positive gains.